When I saw the CPAN PR Challenge come up in my feed, I signed up immediately. I love giving back to FOSS and this challenge would push me to make contributions that are outside of the usual software that I contribute to. For January, I was assigned Clone. I looked at the reverse dependencies and saw 181 packages. I immediately thought to myself, "I'd better be careful. I don't want to break things.". This means that testing is very important for this package. add continuous integration with Travis-CI, code coverage with Coveralls, and adding badges for each of those. go through the bug queue and fixing the open tickets. I went for the easy ones first. I knew that adding the Travis-CI integration was just a matter of creating a .travis.yml file, but what actually goes in that file can vary quite a deal. I had noticed that haarg had created a set of helper scripts that can grab various pre-built Perl versions and run tests against them all. and enabled my fork of Clone in the Travis-CI and Coveralls settings. After pushing this, the tests ran, but I kept seeing n/a code coverage on Coveralls. I was very confused because the code coverage was working just fine locally. I jumped on IRC and chatted with haarg. He pointed out that I was using prove -l as in the example, but since Clone is a compiled module, I needed to use prove -b.
Oh. Silly me! I had been using prove -b locally, but never changed the .travis.yml file. That serves me right for copying-and-pasting without looking! Something good came out of it though: this ticket for Test::Harness has suggestions that will help catch this error if anyone else makes the same mistake. 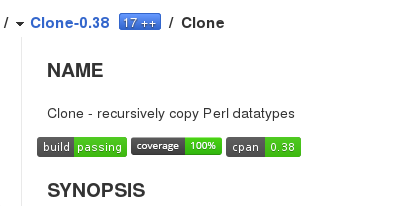 and a list of the Perl versions to test. I used that and ran it through Travis-CI and everything just worked! Now all I had to do was grab the HTML for the badges and put them in the POD and Markdown. I went to the Travis-CI and Coveralls pages and copied the Markdown for those badges and then went to http://badge.fury.io/for/pl and entered in Clone to get a version badge for Clone on CPAN. I then made a few grammar fixes and converted the POD into Markdown for the README and I was done! The pull request with my changes is at https://github.com/garu/Clone/pull/4 and my changes are in Clone v0.38.